Dr. Viviane Bunin [pictured] has joined the staff of Northshore Medical and Aesthetic Center as their first Rheumatology Expert. A spokesperson said, “Dr. Bunin is a Rheumatologist who received her initial medical degree from the University of Pernambuco [Brazil] in 1992 and completed her Rheumatology Residency and a post-graduating program, earning PhD degree/Doctorate in Medicine, at the prestigious University of Sao Paulo in Brazil, and in collaboration with Necker Hospital in Paris, France in 2000 under the tutoring of Dr. Renato Monteiro. 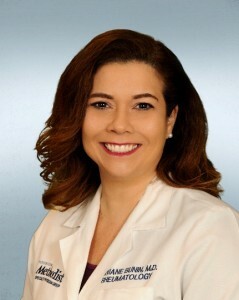 “In addition to clinical experience she has also done clinical and basic research, completing a post-doc/PhD research fellowship in Immunology/rheumatology at Hospital for Special Surgery in NYC and University of Washington in Seattle, as well as Necker Hospital in Paris. Dr. Bunin also is involved with teaching of medical students, residents and fellows. “When Dr. Bunin’s husband became an anchor at ESPN, she moved to Connecticut and completed her American residency at Baystate Medical Center – Tufts University School of Medicine. She completed another Rheumatology fellowship at Yale University and continued research under Dr. Joseph Craft, together publishing work done in collaboration between YALE University in New Haven and the University of Sao Paulo in Brazil. “Dr. Bunin is Board Certified in Internal Medicine and Rheumatology. She is a member of the American College of Rheumatology, where she has presented multiple posters/abstracts. Currently she works at Houston Methodist Hospital, where she sees both inpatients and outpatients and is responsible for the subdivision of Rheumatology for the Internal Medicine Residency Program. “Rheumatology patients often endure years of misdiagnoses and a failure to see their symptoms improve. Patients come to see a Rheumatologist in our division from all around the world because they know they are consulting with doctors who understand that the clues for proper diagnosis are often hidden in apparently-unrelated details. “We value the time spent with you and believe that a true partnership between physician and patient is the key to a successful control of your disease. Dr. Bunin has more than 20 years of experience in Academic Rheumatology, practicing Medicine at the highest standard of excellence. 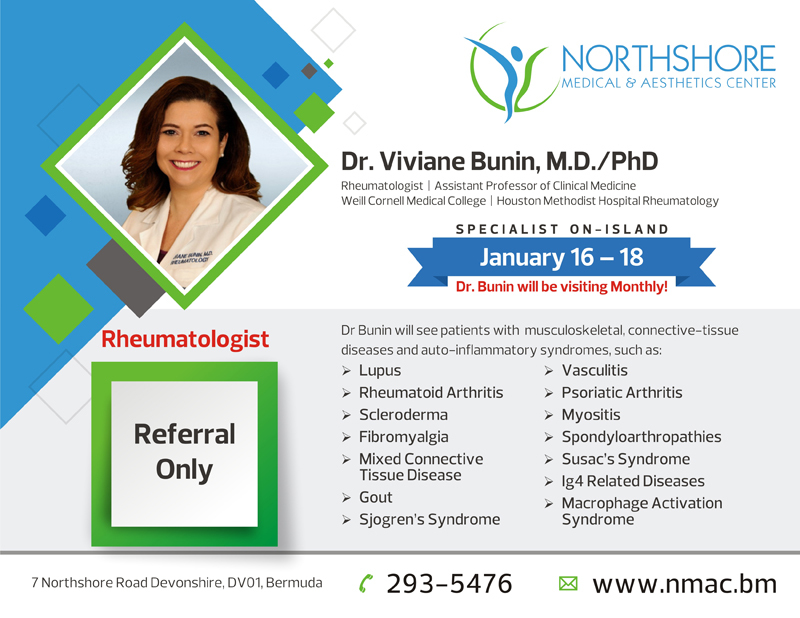 Dr. Bunin will be in Bermuda monthly beginning this month and will see patients with musculoskeletal, connective-tissue diseases and auto-inflammatory syndromes, such as Antiphospholipid Syndrome [APS], Arthritis, Autoimmune Diseases, Behçet’s Disease, Bursitis, Calcium Pyrophosphate Deposition Disease, Carpal Tunnel Syndrome, Classic Polyarteritis Nodosa, Cryoglobulinemia, Degenerative Disc Disease, Dry Eyes, and Enthesopathy of Hip [incl. Trochanteric Bursitis]. Dr. Bunin will also see patients with Fibromyalgia; Foot Conditions; Gout; Hammer Toe; Immune Thrombocytopenic Purpura [ITP]; Low Back Pain; Osteoarthritis of Ankle and Foot, Hand or Wrist, Hands, Hip, Hip and Thigh, Knee, Shoulder, and Spine; Osteopenia; Osteoporosis; Patellofemoral Pain Syndrome or Knee Pain; Plantar Fasciitis; Polymyalgia Rheumatica [PMR]; Polymyositis; Psoriatic Arthritis; and Raynaud’s Disease. Additional, Dr. Bunin will see patients with Rheumatoid Arthritis, Sarcoidosis, Sjögren’s Syndrome, Spondylitis, Still’s Disease, Systemic Lupus Erythematosus [SLE], Systemic Sclerosis, Vasculitis, and Wegener’s Granulomatosis.